Thank you thank you to all the Babes and now our Buddies that joined me in baking the bread I chose for July, Hamburger Buns from Williams Sonoma. I am so happy that you enjoyed them so much. It's definitely a recipe I will make again. My apology to Rita at Soep Kipje, I can't get a photo of her delicious buns to download. Thanks again Ladies! Y'all are the best looking Bread Baking Buddies I've ever seen! I had a hankerin' (oh yes I did) for gazpacho now that our weather has turned more summery. I was going to make my usual version with V8, but in the freezer I found a bag of tomatos that I had oven roasted and frozen last fall. I used this recipe as my inspiration, but I went much simpler. 2 bell peppers (I used one orange and one red) whizzed smooth in the food processor with a few cloves of garlic and a spoon of sugar. I added my thawed tomatos and juice and pureed until smooth. I stirred in a couple of shots of red wine vinegar and some salt, then chilled for an hour. Serve with a piece of cheesy toast, and a chocolate chip cookie for dessert. Good grief! Can you believe it's already July 16th? 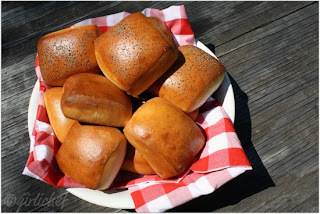 Not only does that mean that July is already more than half over (sob) but that also means it's time for the Bread o' the Month from the Bread Baking Babes. And guess who got to choose the bread this time around? Moi! I chose Hamburger Buns from a recipe card I picked up in Williams Sonoma. The recipe gives instructions for regular sized buns as well as sliders (aka the most adorable things ever). In a small saucepan over medium heat, combine the milk and butter and heat until the butter is melted, about 7 minutes. Remove from the heat and let cool to 105-155'F (40 to 46'C). Add the yeast and stir until the yeast is dissolved. Let stand for 10 minutes. In the bowl of a stand mixer fitted with the dough hook, combine the 4 cups of flour, the sugar and salt and beat on low speed until combined, about 30 seconds. Add the milk mixture and knead until the dough forms a ball, about 1 minute. Increase the speed to medium low and knead until the dough is smooth and elastic, 4 to 5 minutes. Remove the dough from the bowl, oil the inside of the bowl and return the dough to the bowl. Cover tightly with plastic wrap and let the dough rise in a warm place until doubled in volume, about 1 hour. Line a baking sheet with parchment paper. On a lightly floured work surface, roll out the dough into a 10 by 7 1/2 inch (25 by 19 cm) rectangle. Using a ruler as a guide, cut the dough into 2 1/2 inch (6cm) squares. Transfer to the prepared baking sheet, spacing the buns evenly apart, and cover tightly with plastic wrap. Let rise in a warm place for 30 minutes. Remove the plastic wrap from the baking sheet. 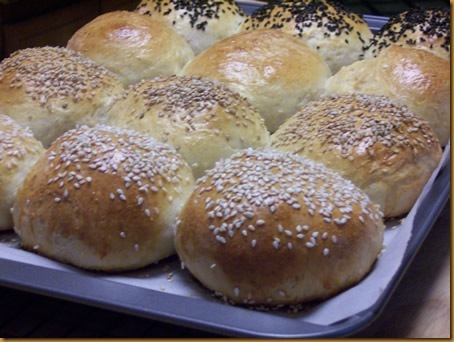 Brush the tops of the buns with the egg mixture (I brushed the tops with milk) and sprinkle with sesame seeds if using. Bake until the buns and golder and an instant read thermometer inserted into the center of a bun registers 190'F (88'C), 14 to 16 minutes. Transfer the buns to a wire rack and let cool completely. Cut in half and use as hamburger buns. Makes 12 hamburger buns. For slider buns: Follow the instructions above but roll out the dough into a 9 inch (23 cm) square. Cut into 1 1/2 inch (4cm) squares and place on 2 parchment lined baking sheets. Cover tightly with plastic wrap and let rise in a warm place for 30 minutes. Position one rack in the upper third of an over and one rack in the lower third and preheat to 400'F (200'C). Brush the tops with the egg mixture and sprinkle with sesame seeds if using. Bake for about 14 minutes, rotating the baking sheets from top to bottom and 180 degrees halfway through baking. Makes 36 slider buns. Time got away from me once again and I didn't have time to try to make slider buns before it was time to post. But I hope to soon and will show off my results. If you'd like to be a Buddy, please make the bread and post about it by July 29th. Send mt a link at iliketocook AT shaw DOT ca. Sorry I've been so absent and things are kind of not interesting around here. I'm working hard on getting myself out of this funk. Keep your fingers crossed for me please. Bought at DeMille's Farm Market in Salmon Arm. Corn, kale, leaf lettuce, 2 kinds of apples, blueberries, cherries, carrots, potatos. Missing: loaf of cheese bread. Kitchen of the month - Ilva from Lucullian Delights. Result - Delicious and easy. Delicious and easy are 2 of my favorite things! Apologies for this brief post. 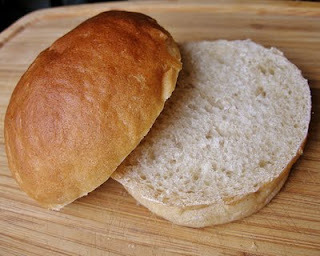 If you'd like to be a buddy, or just make the bread, visit Ilva's website here to see the recipe. All the Babes are listed over on the left for your viewing pleasure. Sweet and mellow with a crunch like a kiwi fruit. Yum. I received "Jamie's America" for Christmas - just a beautiful book. The photos of not only the food but also the places visited are spectacular. I haven't spent a lot of time with this book yet, but 2 recipes jumped out at me and demanded to be made- Southern Pecan and Apple Salad, and Competition Chicken. I have a weakness for bbq - good bbq, real(ish) bbq, and this chicken is definitely the best bbq chicken I've made. That didn't use a bbq. So delicious. I was really pleased with this. Super easy and very tasty. And if you click this link here, you can see the nutritional info courtesy of Health.com (although they've scaled it down to 6 servings and in the book it's 4). 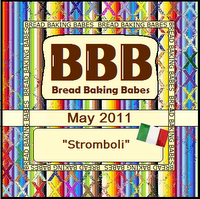 Elle from Feeding My Enthusiasms was the lucky lady to choose our bread for May, and she chose the Stromboli. The stromboli is a sandwich in every slice - meat and cheese layered on a lovely bread dough, rolled up and baked. The recipe is straightforward to make and the results are delicious. Our stromboli was layered with proscuitto and salami and swiss cheese and basil. I rolled it up as tight as I could, sprinkled it with salt and baked it. Unfortunately I forgot the apparently critical step of piercing the bread before cooking, presumably so your bread doesn't bake up hollow like mine did. Regardless of the big air pockets in the bread, it was delicious. As Elle mentioned in her post to us Babes, this is a perfect picnic food. If the warm weather decides to stick around, maybe we'll find out! Please visit Elle for the recipe, and all the deets on being a Buddy with her delicious pick. And please visit the participating Babes (listed over on the left) to see their breads as well. Miracles of miracles I managed to bake this months Bread Baking Babes Bread - Dan's Garlic Bread from Natashya at Living in the Kitchen with Puppies. This is a FANTASTIC garlic bread. At first the recipe intimidated me, but it's not hard or complicated, it just takes a while. You start by cooking some whole garlic cloves and making them fabulous. When you dough is ready they get kneaded in. The dough is cut into 3 loaves for baking. I think I overworked the dough at the cutting and forming stage, but they came out very rustic and adorable. If Scott hadn't been home when I made this, and knew that there were 3 loaves, I would have eaten a whole one myself. Can I say it again? Fabulous. You guys will want to make this. Go and visit Natashya and get the recipe here. I have always liked hamburgers. But when I was pregnant, I LOVED them. I ate them nearly every week, more often if possible. We mostly made our own at home, but we did eat them out occasionally - a few times at Red Robin (teriyaki burger with pineapple), if I was lucky enough to get my prenatal appointment scheduled just before lunch. I was not above fast food burgers either, and may have waddled over to McDonalds (more than once) on my lunch break for a hamburger (regular burger, extra ketchup). At home my favorite was a burger cooked on the barbecue with barbecue sauce and topped with cheese and relish. I never got very fancy, because spending time on fancy burgers meant it took longer before I could start eating. We haven't had burgers very often lately, and I'm not sure why. It seems I am always looking for fast and easy and cheap and healthy meals, and I guess I forgot that a burger can fit that bill. Hey, 3 out of 4 ain't bad. We were talking about burgers a few weeks ago and this recipe popped into my head - Robert Olguin's Buckhorn Burger recipe from Bobby Flay's Throwdown cookbook. A green chile cheeseburger sounds like a lot of work, but this one really isn't. Cook your burger, and while it's cooking, heat a small pan, with a touch of oil, and add some diced red onion. Let that cook for a couple of minutes, then divide into piles (1 pile for each burger you are cooking). Top each pile with some cheese and let it sit over low heat to melt the cheese and soften the onions. In another pan mix some diced green chiles (we used canned) and some granulated garlic and warm through. Spoon the chiles on to the onion and cheese piles. Put your burgers on the buns, top the patty's with the onion/cheese/chile piles, and garnish with lettuce, tomato, pickles and mustard. I tried this recipe out after we decided to have a Hawaiian Feast for Christmas. It didn't make the cut, but it was a great dish. I think it's the only dish I've made out of my Sam Choy cookbook, but I've marked so many pages I'd like to try. The photos in the book are absolutely mouthwatering! We may have to have a Hawaiian week here. I'll use Sam and my Maui Taco book as well.....Here I come Hibachi Miso Chicken with Peanut Butter! What I liked most about this dish was that it had spinach in it. I too often turn to my "staple" vegetables (peas, corn, carrots) and forget about the rest. I haven't had the interest and passion for cooking lately that I used to have and it's been reflecting in my dinner menus. The recipe in the book calls for young taro leaves, which are to be boiled first, but notes that fresh spinach can be used instead. In a large saucepan heat butter and saute onions until translucent. Add chicken and cook 3 minutes, stirring frequently. Add chicken stock, coconut milk, spinach and salt. Simmer 20 minutes or until chicken is cooked. I came across Nigella Lawson's recipe for Apple Latkes and lo and behold I had all the ingredients on hand for breakfast the next day. They were fairly fast to make and very very delicious - my bottomless pit of a child ate 4 of them! I have no photos to show as all the ones I took were so bad I was ashamed. And if you've seen some of the pictures I've posted over the years then you'll know just how bad they were. This is my new favorite way to make scrambled eggs. They come out amazingly light and fluffy and contain only 2 ingredients. We started off Sunday with toast and scrambled eggs and strawberries and blackberries. I made a HUGE pot of pasta sauce with zucchini, onions, garlic, red bell pepper, mushrooms and spinach. There was enough to fill 9 containers for freezing. I got our menu plan and shopping list done. Then it was time to read. Paxton is having his nap and I'm psyching myself up to attack the tower of laundry that's piling up. Later we'll head out for groceries and maybe a walk. This post was timely.....4 or 5 months ago. You may remember the big fuss the KFC Double Down caused - the "sandwich" made with chicken in place of the bun? I wanted to go and try one, but I just couldn't bring myself to do it. So instead we made our own. I cut the chicken breasts in half through the middle, then dipped them in beaten egg while, then panko bread crumbs. And then I baked 'em. Meanwhile, I crisped some pancetta, and made a honey mustard sauce with honey, mustard and yogurt. 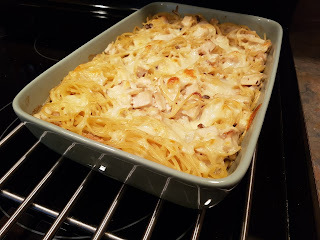 When the chicken was cooked we topped one piece with sauce, cheese (I think it was Swiss) and pancetta. Then laid the second piece of chicken on top. The end result was good - the chicken was flavorful and crunchy. Pancetta is always tasty and the sauce was quite nice. It was fun to try but not something I'd make on a regular basis. How it would compare to an actual double down though, I guess I might never know. Man I wish I owned this book. Delicious! I skipped the mango chutney in the salad and used lettuce instead of spinach. I would make this again. Recipe here. Ham and Apple Wraps with Dip, you guessed it, Martha Stewart. These were fine, nothing thrilling. A little different. I didn't love the dip though. Recipe here. I really liked this salad. Crunchy and...citrusy. I left out the cucumber. Recipe here. Bubble and Squeak, no recipe. So easy. Mix leftover mashed potatos with leftover cooked carrots and brussel sprouts. Heat some olive oil and butter over medium high heat, spread the veggies in and cook until brown on both sides. I do love to change my mind, abandon project etc, and I'm doing it again. This will be it for now at least on Book 5. It's too difficult to fit some of the recipes into our world full of kid, work, school etc. There are still some I want to make, so the book will be back but now let's move on to a new one....Book 3! Bread Baking Babes 3 Year Babe-eversary! What lasts 3 years anymore? Not much. What started for me 3 years ago with this baking group became something important and inspiring in my life. A group of ladies from different countries, different lives, different ages, different experience levels became Babes and friends and made a forum where we can talk and share both our triumphs and tragedies in bread and in life. To celebrate our Third Anniversary of our group we decided to take a walk down memory lane. Bake a bread from our archives. When we first made the decision, I thought I might made 3 breads, one from each year of Babe-hood, but man. I hate to say I don't have the time or energy right now. So I picked one I was most proud of the first time around. I chose to make Gorel's Brunkans Langa bread again. What I love about this bread is the color, the rustic shape of the loaf, the hearty and just slightly sour taste. I also love that although this is a bread that takes time (5 days), it is not a difficult bread. It's an easy bread when you want to bake but don't have a day or large chunk of a day to devote. My beautiful Babes, past and present! I raise my glass to you. Thank you for the last 3 years. Thank you for your kindness and friendship and support and inspiration. I can't wait to see what we'll do next. Waiter, there's goat cheese in my burrito! The first time I saw this recipe it didn't appeal to me at all. Goat cheese and burritos don't seem like they could go together. But the idea grew on me and we gave it a try. Loved it. The tangy cheese is brilliant with the beans and tomatos. This is a very fast and low maintenance recipe. Other than cooking some rice there's only a bit of chopping and less than 10 minutes of cooking. I altered the original recipe slightly - I'd say you could get 4-6 nice sized burritos out of this. Heat the oil in a medium skillet over medium high heat. Add the green onions, garlic and cumin to the pan and cook, stirring often for 5 minutes. Meanwhile in another medium pan, heat the black beans and a couple of tablespoons of water over medium heat until hot. Drain off the water. Add the tomatos to the onion mixture and cook 2 minutes more. Stir in the rice. Spread the goats cheese on the tortillas. Spoon the rice mixture on top of the cheese and top with beans. Add salsa and sour cream if desired. Roll up and dig in. Shortly after I wrote about gift ideas for parents of babies just starting to eat, I discovered a long forgotten piece of oil cloth in our storage closet. It definitely helps to keep the floor a bit cleaner during feeding time. If you have a kid, you gotta feed them. It can be stressful when you begin introducing solid food into your babies diet, worrying that you're choosing the right foods at the right time. A great resource for starting out, or adding more variety to your child's diet is SuperFoods for Babies and Children, by Annabel Karmel. SuperFoods covers nutrition from 6 months to 3+ years. And what is great about this book, among other things, is it holds the belief (as I do) that children shouldn't be fed separate meals from their parents, that everyone can and should eat the same things. Things like more fruits and vegetables and less foods that come out of cans. Annabel discusses Superfoods, foods by color categories (Red, Green, White, etc), and the ingredients of a proper diet. But this book isn't boring or preachy. The information is well laid out and informative. This one was for Scott and Paxton as I don't like salmon. It uses a can of salmon and was incredibly easy to make (4 ingredients) and they both loved it. Scott said it would really only be as good as your salmon is, so use as good a quality as you can afford. My favorite of the 4. Roasted potatos, yams and carrots with a dip of cream cheese and ketchup and green onions. I must admit I didn't think the dip would be very good but it was. A good way to sneak in some extra calcium. Meatballs made with ground beef, onion and apple in a sauce with tomatos, bell peppers and a bit of sugar. A little finicky to make, but delicious. Meatless sausages made with cheese and zucchini and bread. You definitely want to make these ahead and chill them in the fridge so they hold together during cooking. Paxton really liked these alot, all 3 of us did. My one quibble with this book has to do with the last 2 recipes above; both used bread or bread crumbs, and both recipes called for white bread or bread crumbs. I found this a little surprising in a book about eating well and teaching children good nutritional habits. I used whole wheat bread and crumbs in both recipes. I don't know. Why wouldn't you? I would wholeheartedly recommend this book to anyone with a small child. We all gotta eat and it might as well be good, fun healthy food, right?